Abstract: Circular RNAs (circRNAs), formed by nonsequential back-splicing of pre-messenger RNA (pre-mRNA) transcripts, have been widely concerned in recent years. With advances in high-throughput RNA sequencing (RNA-seq) technology, previous work has revealed that a large number of circRNAs, which are endogenous, abundant and stable in mammalian cells, may be involved in atherosclerotic vascular disease risk, neurological disorders, prion diseases and carcinomas. Remarkably, interaction between circRNAs and microRNA has already been observed to perform a significant role in a variety of cancers, including gastric cancer and colorectal cancer. Recent work has suggested that circRNAs may play critical roles in the initiation and development of cancers and could become potential new biomarkers for cancers. Herein, we review the current understanding of the roles of circRNAs in cancers and the potential implications of circRNAs in cancer-targeted therapy. With advances in high-throughput RNA sequencing (RNA-seq) technology, recent work has revealed that a large number of circRNAs, which are endogenous, abundant and stable in mammalian cells, may be involved in atherosclerotic vascular disease risk, neurological disorders, prion diseases and carcinomas.8–12 Remarkably, interaction between circRNAs and microRNA has already been observed to perform a significant role in a variety of cancers, including gastric cancer and colorectal cancer, which illuminates pathways to provide diagnostic or predictive biomarkers for cancers.13 For example, Sand et al confirmed a total of 322 circRNAs (143 up- and 179 downregulated) expressed in cutaneous squamous cell carcinoma, and a total of 1603 microRNA response elements (MREs) were found to be part of the differentially expressed circRNAs, which suggested that circRNAs play an important role in tumor formation by interfering with relevant microRNAs. 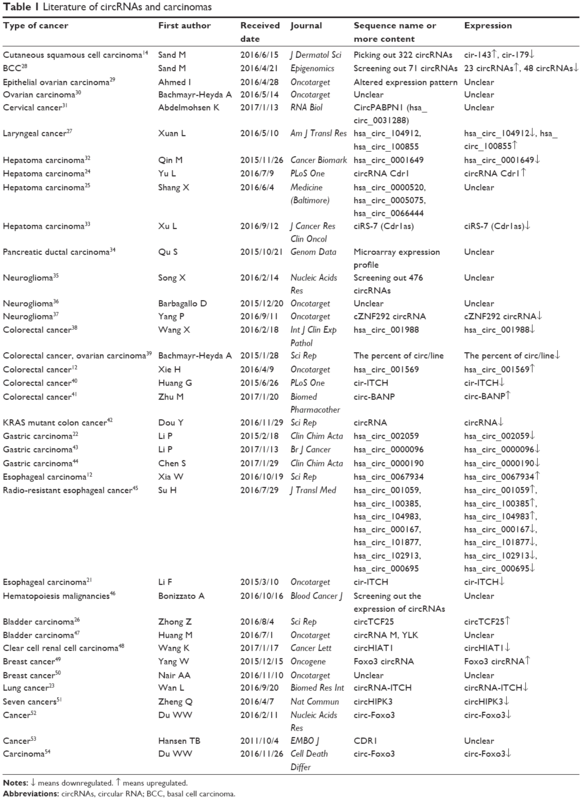 Additionally, this study group analyzed microarray circRNA expression profiles and identified 23 upregulated and 48 downregulated circRNAs with 354 MREs in the basal cell carcinoma (BCC) as well.14 Taken together, these findings indicated that circRNAs have great potential to become new clinical diagnostic and prognostic markers and provide new insights into the treatment of carcinoma. In this review, we briefly delineate the current understanding of the roles of circRNAs and emphasize its potential implications in cancer-targeted therapy. circRNAs, which form a covalently closed continuous loop, are involved in transcriptional and posttranscriptional gene expression regulation.15 circRNAs can be generated from any region of the genome, resulting in a great diversity of lengths. Like the classification system of long noncoding RNAs (lncRNAs), Qu et al classified circRNAs into five types based on their genomic proximity to the neighboring gene: 1) sense or exonic, if it originates from one or more exons of the linear transcript on the same strand; 2) intronic, if it arises from an intron of the linear transcript; 3) bidirectional or intragenic, if it is transcribed from the same gene location of the linear transcript but in close genomic proximity; 4) antisense, if it overlaps one or more exons of the linear transcript on the opposite strand; and 5) intergenic, if it is located between the genomic interval of two genes.16 Beyond this type of classification, another sort of way is established based on the mechanism.4 First, circular viral RNA genomes could be ligated to form 3′,5′- or 2′,5′-phosphodiester bonds with the involvement of host cellular enzymes. Second, circRNA midbodies can be produced during permuted transfer RNA (tRNA) biogenesis in algae and archaea or ribosomal RNA (rRNA) processing. Third, a large amount of housekeeping noncoding RNAs, such as the ribozyme RNase P, were all recognized in circular forms in archaea. Finally, abundant circRNAs may derive from spliced introns and exons. circRNAs have been confirmed to function as microRNA sponges or potent competing endogenous RNA molecules, thereby influencing the posttranscriptional actions of microRNAs as suppressors of the translation in recent literature, in which the association between circRNAs and miR-7 was reported most frequently.17,18 The first microRNA sponge identified was human ciRS-7, which has been detected to be associated with cervical cancer, neuroblastoma, astrocytoma and renal cell and lung carcinoma.19 The overexpression of ciRS-7 acts as a microRNA sponge, arresting miR-7 and therefore elevating the level of miR-7 targets, which regulates the epidermal growth factor receptor (EGFR) expression that further regulates cell growth, proliferation, differentiation and signaling in human cancer cells.20 Similarly, another cir-ITCH, derived from the ITCH gene, presents a sequence enriched with three microRNA-binding sites (miR-7, miR-17 and miR-214) in esophageal squamous cell carcinoma (ESCC).21 Additionally, hsa_circ_001569 was selected as a potential regulator of colorectal cancer progression and had an interaction with miR-145.19 Therefore, the circ-miRNA axis, regardless of promotion or suppression, played an important role in cancer-related pathways and worth further study (Figure 1). 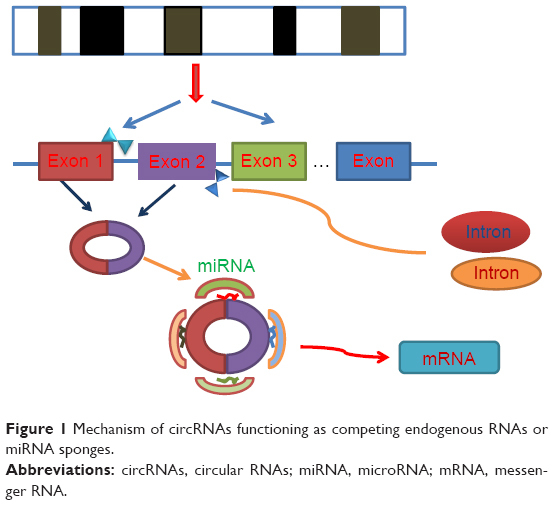 Figure 1 Mechanism of circRNAs functioning as competing endogenous RNAs or miRNA sponges. Abbreviations: circRNAs, circular RNAs; miRNA, microRNA; mRNA, messenger RNA. Previous studies have suggested that circRNAs are competing with alternative splicing or transcription. For example, Ashwal-Fluss et al demonstrated that circMbl is generated by the second exon of the splicing factor muscleblind (MBL), which competes with canonical pre- messenger RNA (pre-mRNA) splicing. circMbl and its flanking introns contain conserved muscle blind-binding sites, which are strongly and specifically bound by MBL. Modulation of MBL levels strongly affects circMbl biosynthesis, and this effect is dependent on the MBL-binding sites.5 Therefore, this suggests that circRNAs can function in gene regulation by competing with linear splicing. circRNAs have been reported to be involved in many human diseases, especially in carcinomas. Recent works have suggested that circRNAs may play important roles in the initiation and development of cancers and could potentially become new biomarkers for cancers. Up to date, the most frequently studied were that circRNAs mainly serve as microRNA sponges to regulate gene expression. MicroRNAs regulate a variety of essential biological functions such as cellular differentiation, apoptosis and proliferation and thus play a critical role in cancer progression. Based on these clues, circRNAs were found to be closely related to the development of a variety of cancers, all of which are listed in Table 1. In this review, we have listed the expression of circRNAs in various types of cancers and provide potential implications in cancer-targeted therapy (Table 1). Notes: ↓ means downregulated. ↑ means upregulated. Abbreviations: circRNAs, circular RNA; BCC, basal cell carcinoma. Previous studies revealed that circRNAs showed large capabilities in gene regulation by playing microRNA sponge effects. Some circRNAs present as a downward trend to regulate the pathways. For instance, hsa_circ_002059, a typical circRNA, was first found to be significantly downregulated in gastric cancer tissues compared with paired adjacent nontumor tissues, and further research found that lower expression levels of hsa_circ_002059 in plasma were significantly correlated with distal metastasis, tumor–node–metastasis (TNM) stage, gender and age, which might be a potential novel and stable biomarker for the diagnosis of gastric carcinoma.22 In a study of lung cancer, the expression of cir-ITCH was significantly decreased in lung cancer tissues. Ectopic expression of cir-ITCH markedly elevated its parental cancer-suppressive gene, ITCH, expression and inhibited proliferation of lung cancer cells.23 Altogether, these findings suggested that circRNAs may play an inhibitory role in some cancer progression by enhancing its parental gene expression. In the past, circRNAs were considered impossible to play a key role in the biological process because they were thought to be a byproduct of aberrant splicing events or intermediates that had escaped from intron lariat debranching. Thanks to the advancements in high-throughput sequencing technologies and bioinformatics, circRNAs were found to be broadly expressed and perform regulation in atherosclerotic vascular disease, neurological disorders, prion diseases and carcinomas. In summary, functional roles of circRNAs in the regulation of protein-coding gene expression through acting as microRNA sponges, regulating alternative splicing or transcription and modulating the expression of parental genes confer a great variety of functional potential to circRNAs. The fact that circRNAs are found abundant in clinical blood or tissue samples makes circRNA a promising diagnostic biomarker for cancer screening and prognostic evaluation. Although the number of circRNAs with known functions is expanding, there are still thousands of circRNAs whose functions remain unknown. A deeper understanding of circRNA biogenesis may be needed to shed light on the road of functional consequences of circRNA. This work was supported by the Foundation of Nanjing City Committee of Science and Technology to Professor Hongyong Cao. Dawei Rong, Weiwei Tang, and Zhouxiao Li are first authors. Capel B, Swain A, Nicolis S, et al. Circular transcripts of the testis-determining gene Sry in adult mouse testis. Cell. 1993;73(5):1019–1030. Nigro JM, Cho KR, Fearon ER, et al. Scrambled exons. Cell. 1991;64:607–613. Wang H, Yang J, Yang J, et al. Circular RNAs: novel rising stars in cardiovascular disease research. Int J Cardiol. 2016;202:726–727. Chen LL, Yang L. Regulation of circRNA biogenesis. RNA Biol. 2015;12(4):381–388. Ashwal-Fluss R, Meyer M, Pamudurti NR, et al. circRNA biogenesis competes with pre-mRNA splicing. Mol Cell. 2014;56(1):55–66. Zhang Y, Yang L, Chen LL. Life without a tail: new formats of long noncoding RNAs. Int J Biochem Cell Biol. 2014;54:338–349. Jeck WR, Sorrentino JA, Wang K, et al. Circular RNAs are abundant, conserved, and associated with ALU repeats. RNA. 2013;19(2):141–157. Guo JU, Agarwal V, Guo H, Bartel DP. Expanded identification and characterization of mammalian circular RNAs. Genome Biol. 2014;15(7):409. Hansen TB, Kjems J, Damgaard CK. Circular RNA and miR-7 in cancer. Cancer Res. 2013;73(18):5609–5612. Xie H, Ren X, Xin S, et al. Emerging roles of circRNA 001569 targeting miR-145 in the proliferation and invasion of colorectal cancer. Oncotarget. 2016;7(18):26680–26691. Zhao ZJ, Shen J. Circular RNA participates in the carcinogenesis and the malignant behavior of cancer. RNA Biol. 2015;9:1–8. Sand M, Bechara FG, Gambichler T, et al. Circular RNA expression in cutaneous squamous cell carcinoma. J Dermatol Sci. 2016;83(3):210–218. Hansen TB, Kjems J, Damgard CK. Circular RNA and miR-7 in cancer. Cancer Res. 2013;73(18):5609–5612. Qu S, Zhong Y, Shang R, et al. The emerging landscape of circular RNA in life processes. RNA Biol. 2016;11:1–8. Hansen TB, Jensen TI, Clausen BH, et al. Natural RNA circles function as efficient microRNA sponges. Nature. 2013;495(7441):384–388. Weng W, Wei Q, Toden S, et al. Circular RNA ciRS-7 – a promising prognostic biomarker and a potential therapeutic target in colorectal cancer. Clin Cancer Res. Epub 2017. Peng L, Yuan XQ, Li GC. The emerging landscape of circular RNA ciRS-7 in cancer (Review). Oncol Rep. 2015;33(6):2669–2674. Cohen S, Carpenter G, King L Jr. Epidermal growth factor-receptor-protein kinase interactions: co-purification of receptor and epidermal growth factor-enhanced phosphorylation activity. J Biol Chem. 1980;255(10):4834–4842. Li F, Zhang L, Li W, et al. Circular RNA ITCH has inhibitory effect on ESCC by suppressing the Wnt/β-catenin pathway. Oncotarget. 2015;6(8):6001–6013. Li PF, Chen SC, Chen HL, et al. Using circular RNA as a novel type of biomarker in the screening of gastric cancer. Clin Chim Acta. 2015;444:132–136. Wan L, Zhang L, Fan K, Cheng ZX, Sun QC, Wang JJ. Circular RNA-ITCH suppresses lung cancer proliferation via inhibiting the Wnt/β-catenin pathway. Biomed Res Int. 2016;2016:1579490. Yu L, Gong X, Sun L, Zhou Q, Lu B, Zhu L. The circular RNA Cdr1as act as an oncogene in hepatocellular carcinoma through targeting miR-7 expression. PLoS One. 2016;11(7):e0158347. Shang XC, Li GZ, Liu H, et al. Comprehensive circular RNA profiling reveals that hsa_circ_0005075, a new circular RNA biomarker, is involved in hepatocellular carcinoma development. Medicine. 2016;95(22):e3811. Zhong ZY, Lv MX, Chen JX. Screening differential circular RNA expression profiles reveals the regulatory role of circTCF25-miR-103a-3p/miR-107-CDK6 pathway in bladder carcinoma. Sci Rep. 2016;6:30919. Xuan LJ, Qu LM, Zhou H, et al. Circular RNA: a novel biomarker for progressive laryngeal cancer. Am J Transl Res. 2016;8(2):932–939. Sand M, Bechara FG, Sand D, et al. Circular RNA expression in basal cell carcinoma. Epigenomics. 2016;8(5):619–632. Ahmed I, Karedath T, Andrews SS, et al. Altered expression pattern of circular RNAs in primary and metastatic sites of epithelial ovarian carcinoma. Oncotarget. 2016;7(24):36366–36381. Bachmayr-Heyda A, Auer K, Sukhbaatar N, et al. Small RNAs and the competing endogenous RNA network in high grade serous ovarian cancer tumor spread. Oncotarget. 2016;7(26):39640–39653. Abdelmohsen K, Panda AC, Munk R, et al. Identification of HuR target circular RNAs uncovers suppression of PABPN1 translation by CircPABPN1. RNA Biol. 2017;14(3):361–369. Qin M, Liu G, Huo X, et al. Hsa_circ_0001649: a circular RNA and potential novel biomarker for hepatocellular carcinoma. Cancer Biomark. 2016;16(1):161–169. Xu L, Zhang M, Zheng X, Yi P, Lan C, Xu M. The circular RNA ciRS-7 (Cdr1as) acts as a risk factor of hepatic microvascular invasion in hepatocellular carcinoma. J Cancer Res Clin Oncol. 2017;143(1):17–27. Qu S, Song W, Yang X, et al. Microarray expression profile of circular RNAs in human pancreatic ductal adenocarcinoma. Genom Data. 2015;5:385–387. Song X, Zhang N, Han P, et al. Circular RNA profile in gliomas revealed by identification tool UROBORUS. Nucleic Acids Res. 2016;44(9):e87. Barbagallo D, Condorelli A, Ragusa M, et al. Dysregulated miR-671-5p/CDR1-AS/CDR1/VSNL1 axis is involved in glioblastoma multiforme. Oncotarget. 2016;7(4):4746–4759. Yang P, Qiu Z, Jiang Y, et al. Silencing of cZNF292 circular RNA suppresses human glioma tube formation via the Wnt/beta-catenin signaling pathway. Oncotarget. 2016;7(39):63449–63455. Wang X, Zhang Y, Huang L, et al. Decreased expression of hsa_circ_001988 in colorectal cancer and its clinical significances. Int J Clin Exp Pathol. 2016;8(12):16020–16025. Bachmayr-Heyda A, Reiner AT, Auer K, et al. Correlation of circular RNA abundance with proliferation – exemplified with colorectal and ovarian cancer, idiopathic lung fibrosis, and normal human tissues. Sci Rep. 2015;5:8057. Huang G, Zhu H, Shi Y, et al. cir-ITCH plays an inhibitory role in colorectal cancer by regulating the Wnt/beta-catenin pathway. PLoS One. 2015;10(6):e0131225. Zhu M, Xu Y, Chen Y, Yan F. Circular BANP, an upregulated circular RNA that modulates cell proliferation in colorectal cancer. Biomed Pharmacother. 2017;88:138–144. Dou Y, Cha DJ, Franklin JL, et al. Circular RNAs are down-regulated in KRAS mutant colon cancer cells and can be transferred to exosomes. Sci Rep. 2016;6:37982. Li P, Chen H, Chen S, et al. Circular RNA 0000096 affects cell growth and migration in gastric cancer. Br J Cancer. 2017;116(5):626–633. Chen S, Li T, Zhao Q, Xiao B, Guo J. Using circular RNA hsa_circ_0000190 as a new biomarker in the diagnosis of gastric cancer. Clin Chim Acta. 2017;466:167–171. Su H, Lin F, Deng X, et al. Profiling and bioinformatics analyses reveal differential circular RNA expression in radioresistant esophageal cancer cells. J Transl Med. 2016;14(1):225. Bonizzato A, Gaffo E, Te Kronnie G, Bortoluzzi S. CircRNAs in hematopoiesis and hematological malignancies. Blood Cancer J. 2016;6(10):e483. Huang M, Zhong Z, Lv M, et al. Comprehensive analysis of differentially expressed profiles of lncRNAs and circRNAs with associated co-expression and competing endogenous RNAs networks in bladder carcinoma. Oncotarget. 2016;7(30):47186–47200. Wang K, Sun Y, Tao W, Fei X, Chang C. Androgen receptor (AR) promotes clear cell renal cell carcinoma (ccRCC) migration and invasion via altering the circHIAT1/miR-195-5p/29a-3p/29c-3p/CDC42 signals. Cancer Lett. 2017;394:1–12. Yang W, Du WW, Li X, Yee AJ, Yang BB. Foxo3 activity promoted by non-coding effects of circular RNA and Foxo3 pseudogene in the inhibition of tumor growth and angiogenesis. Oncogene. 2016;35(30):3919–3931. Nair AA, Niu N, Tang X, et al. Circular RNAs and their associations with breast cancer subtypes. Oncotarget. 2016;7:80967–80979. Zheng Q, Bao C, Guo W, et al. Circular RNA profiling reveals an abundant circHIPK3 that regulates cell growth by sponging multiple microRNAs. Nat Commun. 2016;7:11215. Du WW, Yang W, Liu E, Yang Z, Dhaliwal P, Yang BB. Foxo3 circular RNA retards cell cycle progression via forming ternary complexes with p21 and CDK2. Nucleic Acids Res. 2016;44(6):2846–2858. Hansen TB, Wiklund ED, Bramsen JB, et al. microRNA-dependent gene silencing involving Ago2-mediated cleavage of a circular antisense RNA. EMBO J. 2011;30(21):4414–4422. Du WW, Fang L, Yang W, et al. Induction of tumor apoptosis through a circular RNA enhancing Foxo3 activity. Cell Death Differ. 2016;24(2):357–370.